My mother had a single sibling, a sister Dorothy, while my father had six: a twin brother who died in infancy, another who died a hero at Normandy (see Namesake), and four sisters: Geraldine, Imogene ("Jean"), Virginia, and Lucille. 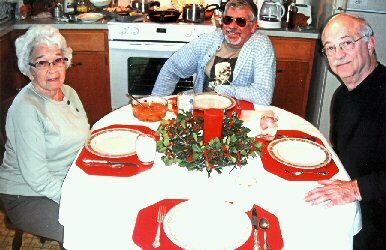 Here I am with the latter aunt (and her son Sid—see Cousin) a week before Christmas 2011 at her home in Lexington, Kentucky. The following January 17 she turned 91. As her nephew, I thought she would be an ideal choice to complement this persona, because she is the family's genealogist.